(a) Check the wiper low operation. 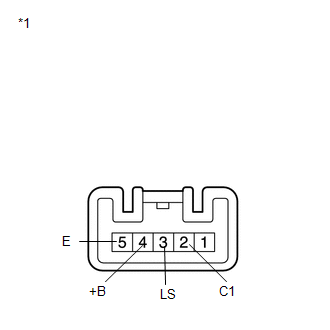 (1) Connect a battery positive (+) lead to terminal 4 (+B), and a negative (-) lead to terminal 3 (LS) and terminal 5 (E), and check that the motor operates. If the result is not as specified, replace the motor assembly. (1) Connect a battery positive (+) lead to terminal 4 (+B), and a negative (-) lead to terminal 2 (C1) and terminal 5 (E), and check that the motor operates. If the result is not as specified, replace the rear wiper motor and bracket assembly.